It is now clear that human activity has influenced how the biosphere supports life on Earth, and given rise to a set of connected environmental and social problems. In response to the challenge that these problems present, a series of international conferences and summits led to discussions of sustainable development and the core dilemma of our time: How can we all live well, now and in the future, without compromising the ability of the planet to enable us all to live well? This book identifies the main issues and challenges we now face; it explains the ideas that underpin them and their interconnection, and discusses a range of strategies through which they might be addressed and possibly resolved. These cover things that governments might do, what businesses and large organisations can contribute, and the scope for individuals, families and communities to get involved. This book is for everyone who cares about such challenges, and wants to know more about them. "What a wonderfully readable cornucopia of information and ideas – an inspiring and practical source for confidently talking about and acting on behalf of a sustainable future!" "This is a lucid collection of short chapters on some of the world’s most intractable issues like globalisation, climate change, human population and migration. It is a unique and prescient contribution that helps make sense of an increasingly unpredictable and unsustainable world." "These informed authors help readers understand vital issues about sustainability and how we live today. Importantly, they set out a range of strategies whereby everyone who's interested can play a role in keeping our planet living for generations to come." "I loved this book. The authors have written short but informative, provocative, and amazingly readable chapters on a wide range of issues, concepts and strategies that help us think about how we might create a more sustainable and just future. The format is brilliant!" 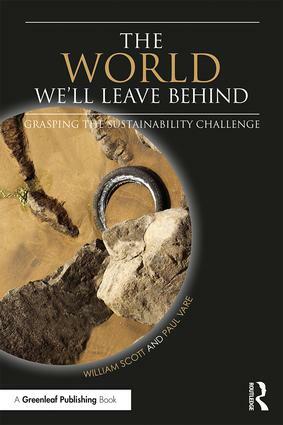 "Scott and Vare have written a very clear, accessible introduction to the sustainability idea and some of its difficulties – an excellent book for people coming new to the topic, and one from which everyone can gain new insights." William Scott is Emeritus Professor of Education at the University of Bath, UK, and is Chair of Trustees of the UK’s National Association for Environmental Education. Paul Vare is Postgraduate Research Lead for the School of Education at the University of Gloucestershire, UK, and a Director of the South West Learning for Sustainability Coalition.